Learn the signs of hazing here. Coach Kevin Clark hosted a fun round robin tennis mixer to benefit set2serve.net and awareawakealive.org. Many of Carson’s tennis buddies and plenty of adults came out to play on a Friday night. Everyone had a chance take part in coached drills and some competitive play. Thirty tennis racquets were donated to the se2serve program. Thank you all and we look forward to seeing you at next years tournament. The third annual Golf for Lacrosse Tournament was “the best one yet”. It was a beautiful Spring day, cool, and just windy enough to keep things interesting on the golf course. Tournament proceeds will be used to provide funding for the Austin High Boys Lacrosse Team and support our mission to facilitate alcohol and hazing awareness programs. We sincerely thank all the sponsors, participants, and many volunteers who made this years event a success. Discussions are already underway about next year’s event. See past tournament photos here. We welcomed lots of new faces, even some from California, as we honored Carson's life and brought awareness to the the dangers of hazing and alcohol poisoning. Together we carried the quilt made from Carson's shirts representing the nine Cap 10s he completed. 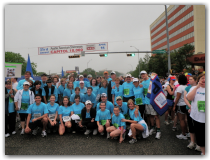 See past "sea of blue" photos here. 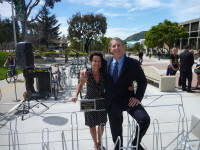 A bicycle rack dedication took place in the Cal Poly University Union and the bike rack was then carried by students to its permanent location. This Memorial will be a frequent reminder of Carson's zest for life as it continues to serve Cal Poly students. A luncheon followed the dedication where we announced the Carson Starkey Memorial Scholarship for two students from the College of Architecture in the Fall of 2011. We are very grateful for the sustained support Cal Poly and the entire San Luis community continues to show our family.